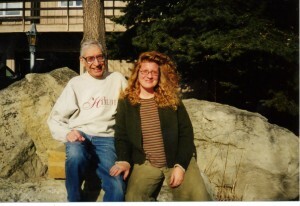 One year, when my dad’s birthday rolled around, my mom didn’t know what to buy him for a gift–he already lived under Montana’s Big Sky and possessed a lovely tenor voice, both of which made the case for him as A Man Who Had Everything. So she did as many a clever gift giver had in the past: she made his present. She made him a baby, and that baby was me. 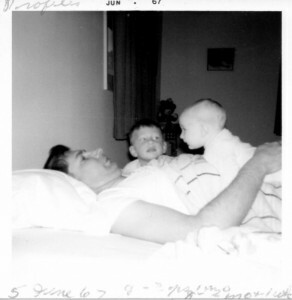 I was wrapped in a soft blanket and presented to my dad on March 25th, 1967. That day, I was zero; he was thirty-two. The day before, his own mother–born in a dugout sod house forty miles away from the hospital where I was delivered–had celebrated turning fifty-two. Thirty-three years and six days later, Baby Jocelyn would give birth to her first child, a Girl. 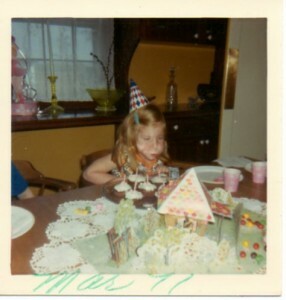 From March 24th to March 25th to March 31st, the last week of March has always been loaded with birthdays in my family. One of the many beauties of my life has been my status as Baby of the Family. 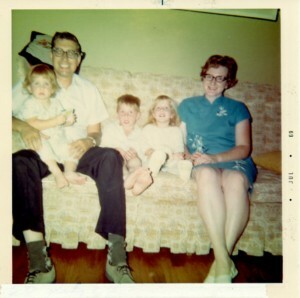 As the third of three kids, I enjoyed the best of everybody: I was Mamma’s Girl, Sister’s Girl, Brother’s Girl…and, of course, as his special present in 1967, Daddy’s Girl. 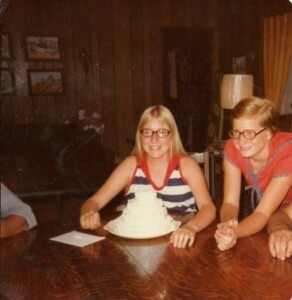 As the years passed, we always enjoyed sharing a birthday. Naturally, Dad didn’t get feted the same way I, a kid, did. 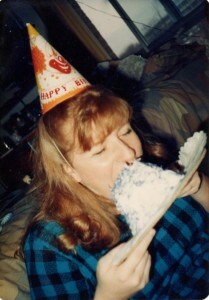 For me, there were party hats and friends gathered ’round and much-observed blowing out of candles. But for adults, life is just life, including birthdays. I blew out candles; my dad went to work. Then the next day would come, and then the next week would roll around, and then it was April, and then it was summer, and then there was gardening. Mixed in to every year were the birthdays of others, such as my sister below, turning twelve, much to my delight (CAKE!). Then the summer would end, school would begin, and it would be fall, then winter, then a new year, more holidays, more birthdays, more life. Always, my mom was there, my brother was there, my sister was there. My dad was there. We took road trips; we ate chili; we watched tv; we dusted the knicknacks. Eventually, it was our birthday again. Eventually, I turned sixteen. 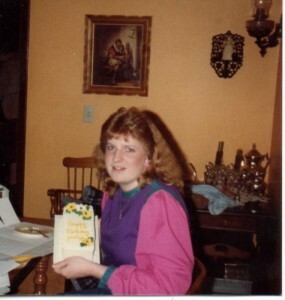 All words–all possible apologies–fail me as I try to make amends for the hair on that sixteenth birthday. Chalk it up to 1983 and the exuberance of youth. I blew out the candles. I opened gifts. I wished my dad a mutual happy, happy day. Cake demolished, we carried on. Back to life. Back to studying and practicing and visiting. Always back to music. 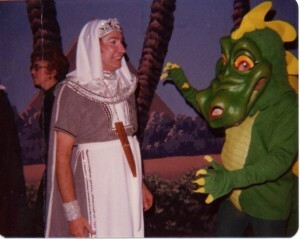 Here, Dad is all tarted up for his role in The Magic Flute. Is there really a dinosaur-lizard creature in Mozart? I was too busy frizzing up the back of my hair to pay proper attention. A few more years passed, and I went off to college, where I was surrounded by new friends, foregoing even silverware on my 19th birthday. As ever, March 25th was followed by March 26th, which then spun back into studying and dancing and lolling. 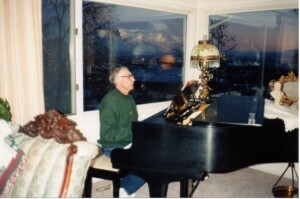 At home, in Montana, the music continued. 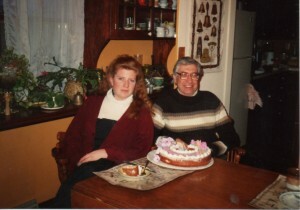 At some point during college, I became enough of an adult that Dad and I could share a cake on our shared day. I’d started from him, gone off onto my own, and come back to rejoin him with more deliberation. Of course, as children do, I then hopped back in my car and drove away. 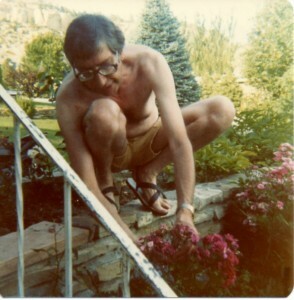 For Dad, there was gardening, music, tv. Life. I graduated and began my own career. 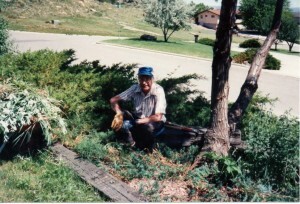 And then my grandma, born on March 24th in that sod dugout on the prairie, died. I sat next to my dad at the memorial service and pressed my leg against his, absorbing the shudders of his body as he wept. Later, in both the hollowest and most meaningful of gestures, I put my hand on his knee. Then I got in my car and drove away. He taught. Gardened. Sang. Observed. As the seasons went ’round and ’round, my brother got married and became a father. I became an aunt. 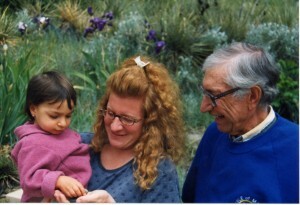 My dad became–most joyful of things!–a grandfather. With a few more spins of Earth’s axis, I, too, married and had a child. My parents’ joy grew. But then we all would get in the car and drive away. He would dig in the dirt, watch his shows, look for coupons. Always and ever, there was music. Sometimes, he and my mom would get in the car and come to us. 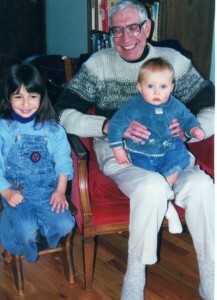 His thousand-watt smile never beamed more brightly than when we was with his grandchildren. My father has four grandchildren, but he only ever met two of them. He was in his final decline in the hospital as I gave birth to Paco. Fifteen days after that emergency C-section, Dad died, alone, still hopeful of a recovery, his heart and lungs finally giving out after years of chronic ailment. Two months later, his fourth grandchild was born. It’s his not knowing his grandchildren as they grow up that slices me most. Now, a decade later, they are, to a one, intelligent and creative and funny and poised. His death at age sixty-seven means his most amazing legacy will never know what they missed. Now it’s March 25th again, and he would be seventy-seven. 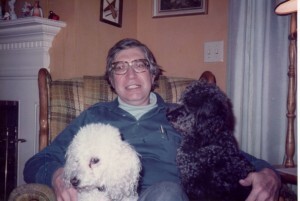 This is my tenth birthday without my father. I am not maudlin or overly-sentimental about his passing. His death means he was alive. and Paco can ask to play baseball at dusk. Birthdays are, of course, our way of marking time, of slowing down long enough to take stock, of noting where we are in the arc of our lives, of taking a guess as to how much more we might still have in front of us. I was his most-original birthday present. He was my gift of a lifetime. This is such a beautiful tribute to your dad. He was clearly quite the fellow (anyone who is willing to wear such a costume and pose with a dragon has my vote for Coolest Father of the Century, in every sense). Once Daddy’s girl, always Daddy’s girl. This brings back such wonderful memories of my dad and the years since he has been gone. Your dad and mine have many things in common…the music, the performing, the daughter with bad hair. What a great view into someone’s life. Those “regular” guys of that generation who just wanted to be a dad, a good citizen, and sing a song once in a while. They never really knew how special they were and wouldn’t have believed it if you told them. What a wonderful post. You and your dad were gifts to each other. And now I have “Will the Circle be Unbroken” in my head. My daughter is so lucky that she has a father like your father–as a girl that grew up without a dad, I envy you such a father. i did not know this about you but i recall other posts about your dad and the relationship you shared with him. 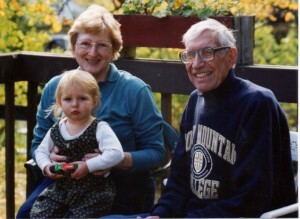 the two of you were indeed a tremendous gift to one another and it gladdens me to know that. the two of you were blessed. and how i love that last picture. oh yes i do. You have put tears in my eyes that were not there before I read this. Again, lovely. Never a wasted word but none left out, humorous, honest, relatable, thought provoking, unique. Lovely, as always, like you. With an attached and intimate family such as yours, no wonder you are intrigued by my Dallas like sprawl of a family. Can’t wait for the book! Do you read the “Modern Love” columns in the NYT? They are published on Sundays and my Sunday night ritual is to read the newest one right before I go to sleep. I think you could submit one for the column. Think about it. What a wonderful tribute to your dad. And happy birthday. Oh, and that purple, green and pink top – aren’t you glad it isn’t the 80s anymore? We are so very similar, you and I: both Daddy’s girls; both so lucky to have appreciated the bonds we have had while still living within them. A most happy birthday week to you! I love your tribute. Your dad sounds so divine. And through you your kids WILL know him, which is a great gift, too, those stories and memories. Oh this choked me up, precisely because it wasn’t maudlin or overly-sentimental. But it was fierce. I can your dad in you, and you in him. Did you get your glee, your wacky joy, your great big heart from him?? . I liked the way you spun through the years, which gave a real sense of just how brief a life is, over almost before you know what you have. Your dad must have known how you felt about him, and if he didn’t completely get it, he does now. Even though I can’t begin to believe there’s anything left after death, I make an exception for the communication of feelings. I’m sorry for your kids that they don’t have him. Despite being 700 miles away, and not seeing my kids all that often, my dad had a big effect on them, especially my eldest. But he was their only grandfather, whereas yours have a spare! In fact, going back to look at the photos once again, I realize I didn’t have to ask that first question. The last picture says it all. Lucky guy he was, getting you for his birthday. 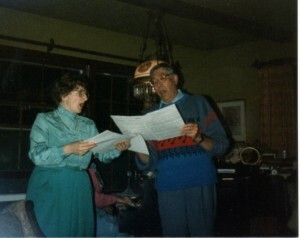 What’s interesting, my dear Deborah, is that no one would have described my dad as full of glee or wacky in the least. He was gentle, reliable, profoundly introverted–quite the Finn that way. He was perceptive and very astute about people. Most in his life had no idea of his great depths; I learned that an amazing test of character was whether or not someone “got” my dad. It’s often the same with Byron, ‘tho to a lesser extent. Anyhow, though he was thoughtful and steady to the end, he actually didn’t come across as anything full of gusto. But I’ll take that compliment of great big heart and attribute a large part of that to him, indeed. How very interesting….I read the thousand-watt smile, the Magic Flute role and the singing as indications of some extroversion. And because there is a physical resemblance between the two of you, I lumped personality in there, too. Ah well, it won’t be the first time an introverted parent has produced an opposite kind of child. 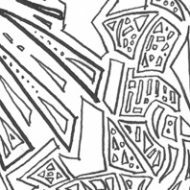 Just tonight we (kids and I) were discussing this, they realizing that I am the sole introvert in a sea of sometimes overwhelming personalities. this makes my heart sing. sadly, but it is singing. This is one of the loveliest tributes to a parent that I’ve read. It’s written with such love, tenderness and humour. I’m sorry you no longer have your father in your life. I can relate to that. 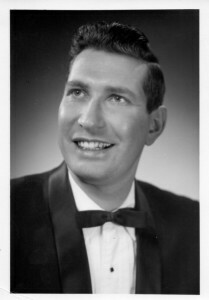 My Dad has 4 grandchildren – none of which were born before his passing. 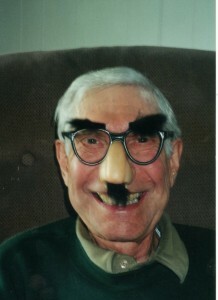 But I’m totally convinced he’s behind their smiling eyes and goofy sense of humour. A belated Happy Birthday to you, Jocelyn. You still share this date with a wonderful man.. and he with you. Well now I need to go call my dad, dangit. What a beautiful tribute to your dad. And happy birthday, dear Jocelyn!! It was lovely, Jocelyn. How nice that he got to know at least a couple of the grandchildren – a little bit. Best of all, he seemed happy. With them, with you, and with life. That has got to be a great thing to remember. happy birthday. and, this is a really sweet post. also, the photo at the end is priceless. And he went away and you went away and so it goes. There isn’t really anything else to say, except that a lifetime’s appreciation, love and laughter are all that matter. It seems to me that you know that. This was such a perfect piece, on life, and family, and being human. Thank you. I had not expected my eyes to moisten at such a seemingly odd hour in the middle of the day. Also, love the song. Such a lovely post to your dad. March 25 was my father’s birthday, too. Lovely post. I often struggle with how my father fits in with my life now. Him never having known my husband or my children. That is truly my biggest sadness, not that I miss him, but they they never will.